Melting glaciers can provide a windfall of water for hydropower plants, such as Zervreila (pictured) in Graubünden. Although rapidly melting glaciers provide a temporary boost to Swiss hydropower production, their disappearance does not pose a threat, finds a study from the University of Lausanne. Forecasts predict that glacier melt will slow down between 2070 and 2090. But “fears of a threat to power generation are unfounded”, according to a press release published on Thursday by the Swiss National Science Foundation (SNSF)external link, which funded the study. “For the first time, a comprehensive model of water flow into Swiss hydropower plants has quantified the contribution from glacier retreat,” pointed out the SNSF. Since 1980, melting glaciers have contributed an average of 4%, or 1.4 terawatt hours (TWh) per year, to the total Swiss hydropower output. As glacial melt slows down, this is expected to drop to 0.4 TWh. This decline would correspond to 2.5% of the total hydropower – which is in line with the federal Energy Strategy 2050external link. 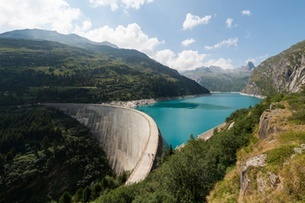 “The slowdown in glacier melt will add to other projected losses in productivity, such as those linked to the Water Protection Act, which governs renewal of concessions granted to dam operators,” stated Bettina Schaefli, holder of an SNSF professorship at the University of Lausanne, in Thursday’s release. She went on to say that the study showed that these losses “should be offset by the expansion of hydroelectric capacity envisaged by the Energy Strategy 2050”. The study’s calculations were based on historical data as well as a simulation of future development. The research appears in the journal Renewable Energyexternal link. Other study participants included scientists from the universities of Lausanne, Fribourg and Zurich; the federal technology institutes of Lausanne and Zurich; and WSL, the Swiss Federal Institute for Forest, Snow and Landscape Research.